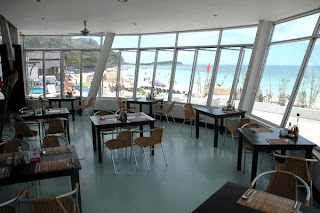 The Seaview Patong hotel is just a few metres from the beach in the quiet southern part of Patong Beach and all the rooms look out over the Andaman Sea. Though the hotel is in the quiet part of Patong Beach it is still only a few minutes walk from the centre of Patong's nightlife, Soi Bangla. A very family friendly resort right on Patong beach. Simply cross the road to get to the beach. 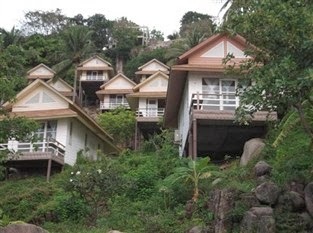 A quiet beach front resort very close to the heart of Patong. How to get there - from Phuket airport you take the main highway south towards the centre of the highway, then following the signs for the beaches turn onto the bypass road. At the big Tesco Lotus intersection turn right following the sign "Patong Beach", then keep going straight for about 8 Km and over the hill to reach Patong. At the bottom of the hill turn right and then turn left into the first road past the Mosque (Rathuthit 200 Pi Road). Continue all the way to the end of this road and then turn right on to Prachanukhro Rd heading towards the beach and then turn left on to Thaweewong road the hotel is about 300 metres along the road on the left side. The Sea hotel is in the heart of Patong Beach, just two minutes walk from the beach and about ten minutes leisurely walk from the centre of Patong's nightlife, Soi Bangla, yet the hotel is also hidden away in a quiet enclave giving you peace and serenity after you've had your fill of hedonism. How to get there - from Phuket airport you take the main highway south towards the centre of the highway, then following the signs for the beaches turn onto the bypass road. At the big Tesco Lotus intersection turn right following the sign "Patong Beach", then keep going straight for about 8 Km and over the hill to reach Patong. At the bottom of the hill turn right and then turn left into the first road past the Mosque (Rathuthit 200 Pi Road). At the third junction (corner Ban Sainamyen School) turn right to reach the Beach Road and then turn right again keeping the beach on your left hand side. On the beach road turn right at the first junction (corner football field), about 50 more meters and you see The Nap Hotel on your left, directly after this is The Sea Hotel. The Old Phuket on Karon Beach in the south of Phuket is designed as a replica of the Sino-Portugese residences that dominated Phuket town in the 19th century, some of which can still be seen in Old Phuket town. This styling evokes memories of tin mining, Chinese Junk merchantmen and the heady days of European colonialism in Asia. The hotel has two contrasting and complimentary wings, the Sino wing with classic 19th cetury styling and the more modernistic elements of the Serene wing. Classic Colonial era styling crossed with modernism right on the beach in easy reach of all the islands facilities make The Old Phuket the perfect base fo your vacation. How to get there - from Phuket Airport head south toward Phuket town, when you reach the bypass junction turn right and follow this road all the way until you reach a roundaboat, at this point take fourth exit (right turn). Continue along this road past 2 sets of traffic lights, after the lights the road goes up a hill then straight for a while before a long left bend followed by a short straight then a sharp right hand bend. Just before the right hand bend the entrance to The Old Phuket is on your left. the ocean on Yai Nee Cape on the north west coast of Koh Tao to the north of Sairee Beach. Beautiful sunset views over Koh Nang Yuan make this a fantastic venue for just relaxing in Paradise. Built into the jungle holding on to to this hill the resort is in symbiosis with the landscape, the small comfortable bungalows, truly stunning panoramic views and the serenity allow for true total relaxation of body, mind and soul. Small Comfortable Bungalow holding on to the hill this is perfect for couples. Just One Kilometre from the private beach. Wifi is available in the lobby and reception. Amazing views from all over the resort and a small private beach make this the perfect Island getaway. How to get there - firstly you need to get to Koh Tao by ferry from Suratthani , Chumporn or from the other gulf of Thailand islands Koh Samui and Koh Phangan. 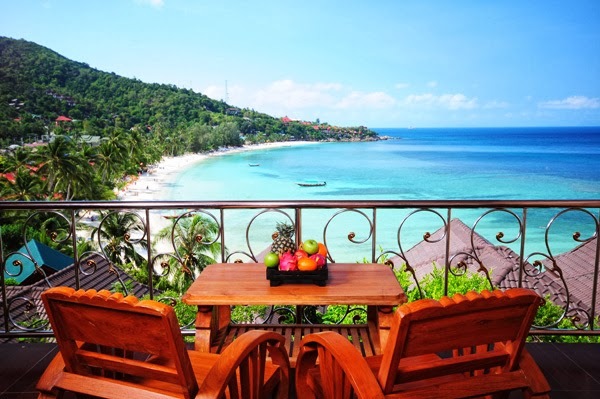 Once you are on the island from Mar Haad town head north past Sairee village to the end of Sairee beach, Koh Tao Hillside Resort is to your left. X2 Vibe Patong Beach Hotel is a chic and stylish resort hotel located just a few steps from Patong Beach, home of Phuket's night life a and shopping. The area surrounding the hotel is very tranquil so a quiet sleep at night is secured while Bangla Road, heart of night life and shopping, is just 10 minutes walk or a short tuktuk ride away. The atmosphere in the hotel is unique, thanks to the modern design and lighting system. Five different styles of rooms for all budgets and wishes, from the simple Day Dream Deluxe room to the luxurious Signature Pool Villa. Perfect for couples, honeymooners and families. Less than one minute walk from the beach and 5-10 minute walk to Patong vibrant nightlife and shopping spots. The rooftop swimming pool, the NAM (New Ayurvedic Massage) Spa, the fitness center and the "76 Bar & Dine" make it the perfect place to stay. Complimentary Mini Bar with daily refill. The location definitely makes this hotel the perfect base for your Holiday in Phuket giving easy access to the best night life and shopping opportunities, as well as being a central starting point for all main destinations for day tours in and around Phuket Island, all with a high quality of stay. This small stylish hotel focuses on customer service so that all guests feel like VIP's, value for money is great. How to get there - from Phuket airport you take the main highway south towards the centre of the highway, then following the signs for the beaches turn onto the bypass road. At the big Tesco Lotus intersection turn right following the sign "Patong Beach", then keep going straight for about 8 Km and over the hill to reach Patong. At the bottom of the hill turn right and then turn left into the first road past the Mosque (Rathuthit 200 Pi Road). At the third junction (corner Ban Sainamyen School) turn right to reach the Beach Road and then turn right again keeping the beach on your left hand side. On the beach road turn right at the first junction (corner football field), about 50 more meters and you will finally find The Nap on your left. For more information about Phuket see our Phuket travel guide. 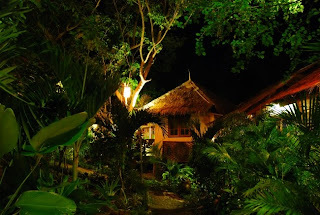 The Leaf Khao Lak is is located in Khao Laks center at just 5 minutes walk from Nang Thong Beach and built on a flatland surrounded by many tropical trees and plant species, perfect for nature lovers. The property has been under complete renovation and expansion during summer 2013 and ready to welcome guests of all ages. 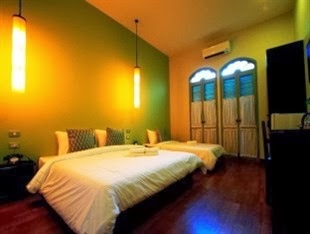 It's a quality budget resort with a total of 92 rooms, two bars and one Thai restaurant. Peaceful resort immersed in the green perfect for families and couples, featuring Building, Cottage and Villa rooms. 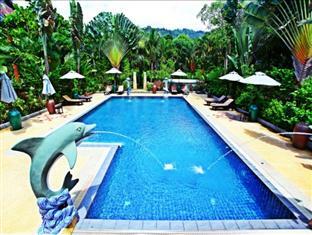 Coveniently located in Khao Lak center at 300m walk from Nang Thong Beach through the resort's shortcut. Adult Pool and Fun Pool with swim-up bar and adjacent Children Pool. Activity Center with Fitness Room, Internet Corner and Game Corner. Mini mart. Outdoor massage pavilion. Garden. Perfect for families and couples of all ages as the resort's ambience and beach are very quiet while the nearby Bang La On area has the largest number of restaurants, bars and shops in Khao Lak. 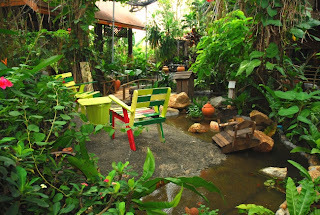 A totally nature-friendly resort where organic fertilizer is produced from compost, waste is recycled, housekeeping uses organic bio-degradable soaps to clean the resort’s surfaces, ingredients are daily sourced from local markets ensuring the most delicious organic and natural flavors. The area is densely surrounded by over a hundred of trees and plants. Inclusive of private return airport transfer (Phuket Airport), two nights accommodation in twin or double sharing Superior room with breakfast, tax and insurance. How to get there - from Phuket or Krabi airport need to get to Khao Lak Beach, arrived at main center after the Khao Lak shopping center take the road left down the beach about 1 Km past the Mc Donald's. 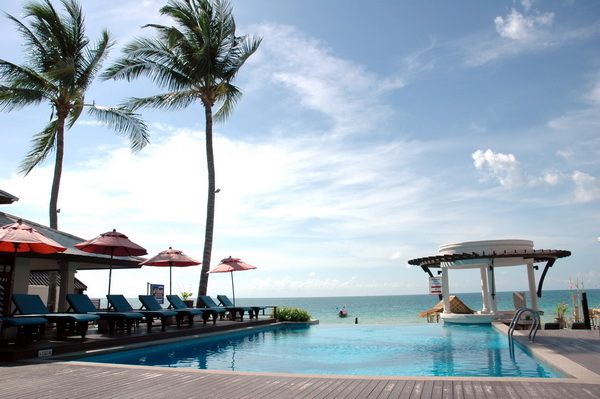 The long swimming pool runs the length of the resort and there is also a children pool. Facilities include a Beach Front Restaurant and Bar. Classic Thai Style Bungalow with wonderful laid back Thai Hospitality in a Serene setting make this the perfect compliment to the excesses of the Full moon Party, an ideal spot to recover. How to get there - Firstly you need to get to Koh Phangan, there are regular ferry services from Donsak Pier in Suratthani and also From Koh Samui, make sure your ferry is arriving at Thongsala Pier. Once you have got to Thongsala you need to cross to the west coast of the Island, the taxi service is included. Full Moon Party - The world famous Full Moon Party is held 13 times per year on Haad Rin on the west coast of Koh Phangan, just 30 minutes from Haad Yao Bungalows. Enjoy the excesses of the largest regular outdoor party in Asia and then recover in the serene peace of Haad Yai. Sugar palm Grand Hillside is set on the hill just behind Kata Beach on the southern west coast of Phuketand is only a two minute walk from the beach. This hotel which opened in 2008 is tucked into the southern corner of Kata beach and climbs up the hill along the natural contours, also incorporating terraces, infinity pools and gardens. The eleven infinity edged pools are designed as a virtual waterfall. The 108 rooms are appointed in a modern minimalist style. 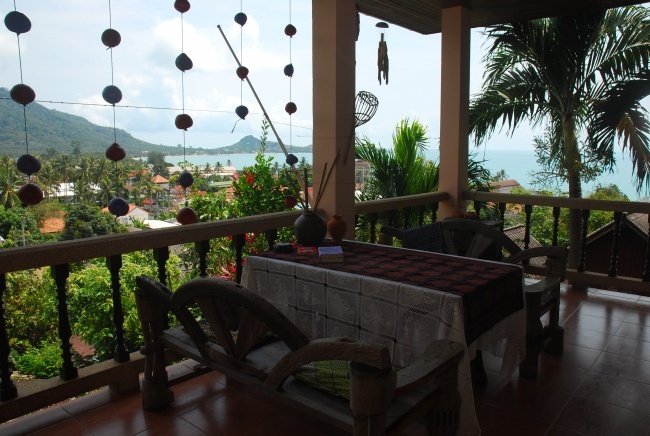 The upper floor have magnificent views of Kata bay. Two minutes from the beach, just a short walk down the hill. Among the eleven pools is a dedicated children pool. Facilities include a Spa, Sauna and fitness room. Modern minimalist design combined with classic Thai style hospitality, just few minutes walk to Kata beach and close to many different styles of restaurants, bars and shops. Also a convenient starting point for tours around the island and beyond. The On On Hotel was Phuket's first hotel, opened in 1929. It was featured in the 1999 film "The Beach". During 2012 & 2013 the Hotel was fully refurbished and reopened under the new name of The Memory at On On Hotel. 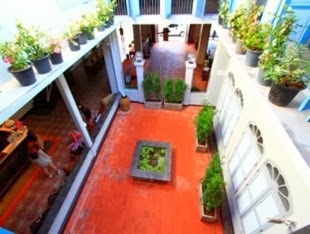 The Memory at On On Hotel welcomes you with Colonial era charm and classic Thai hospitality. A different way to see Phuket and perfect for a transit stop over on your way to Phi Phi or the Islands of the Gulf of Thailand. Inclusive of return airport transfers (Phuket Airport), two nights accommodation in twin or double sharing Superior room, tax and insurance. How to get there - Enter Phuket town on the main highway, Thep Krasattri Road, and continue along this until you enter the one way system. Once in the one way sytem continue straight on along the road until you reach the last junction in the one way system, here you turn right onto Ratsada road, continue straight on until you reach a traffic circle, here turn right and then then first right again onto Phang Nga road. Just ahead of you to your left is the hotel. 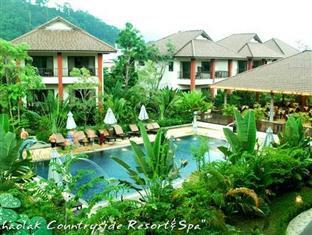 The Khao Lak Countryside Resort and spa is located in Khao Lak Beach in the province of Phang Nga in Thailand. The hotel is built in a beautiful tropical garden, superior rooms are in two buildings with two floors while Deluxe and Villas are in semidetached bungalows around the huge garden. Three minutes from the beach, a small alley in front of the hotel entrance takes to the beach. There is a pool with a section for kids and jacuzzi corner, plenty of sun chairs and umbrellas around the pool, one open air restaurant with corner bar, open all day, massage and small spa. How to get there - from Phuket or Krabi airport need to get to Khao Lak Beach, arrived at main center after the Khao Lak shopping center take the road left down the beach, follow the road and just before Khao Lak Seaview resort will see on the left the hotel entrance.